I write dark fantasy, horror and SF as Nicholas Hallum. You can follow me on my Amazon Author page here, visit me on Twitter or Facebook, or you can sign up for early previews of new stories below. 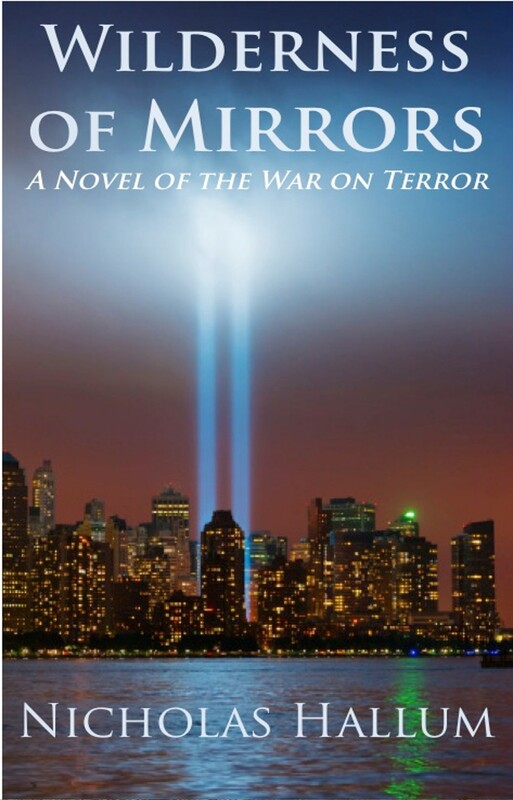 WILDERNESS OF MIRRORS is a sorcerous spy novel set during the War on Terror. The story moves between the 1960s, the 1980s and 2000s, as one man becomes a critical weapon in the djinn-driven arms race behind 9-11. His clandestine journey to unlock his terrible knowledge and understand his own complicity in this supernatural secret history drives forward a fast-paced spy narrative which recalls Tim Powers’ Declare and Neal Stephenson’s Cryptonomicon. Look forward to WILDERNESS OF MIRRORS. After 9-11, one man is caught up in horrific events in Iraq which bring back memories of an arcane set of training rituals that stretched back to his childhood. A preview short story, excerpted from the forthcoming novel WILDERNESS OF MIRRORS. A chilling little Halloween story. Do you like The Twilight Zone? Then you just might want to enter Sanctuary! One neighborhood is lucky to be prepared when the world falls apart. A child narrates the story of how her neighbors found the strength to band together in unity against a self-destructive culture, and find the primeval instincts that might preserve the human race — becoming a bulwark of resistance to societal breakdown. But they’ve made some trade-offs…. What would you do to survive? In 1938, the British Crown anticipated war with the emerging fascist leader Adolf Hitler. The British Secret Service was desperate for code-breakers, and for a method to encode messages to Allied agents on the ground, deep in the heart of the continent. One agent was assigned to solicit the help of a set of secretive, brilliant Cambridge professors to find a solution to this dangerous puzzle. The cryptographic key these professors proposed was radical, and changed the course of the war effort (and English literature) forever…. Bestselling writer Nick Hallum delivers a “how to” manual on fiction techniques for writing fantasy and science-fiction in ways that can convince, enthrall and entrance your reader. Close analysis of fantastic, ghostly, and horrific work by expert writers such as Tim Powers, Toni Morrison, Michael Chabon, Bram Stoker, Tolkien, and many more. Tips on how to create your own horrific and fantastical works! Bestselling writer Nick Hallum is working on a new fantasy novel entitled Sea of Sand infused with stories derived from the sand-sailors who crossed the Saraha and inspired by the works and legacy of Ursula Le Guin. Find out more here. Readers can also sign up for early access to the novel. Coming soon! Nicholas Hallum is the pseudonym for a writer born in Taipei, Taiwan in 1968. He has subsequently been a visitor or foreign resident in Hamburg, Germany; Barcelona, Spain; Buenos Aires, Argentina; Copenhagen, Denmark; London, England; Los Angeles, California; and at the United States Army and Air Force Joint Base Lewis-McChord (JBLM) near Seattle, Washington. At JBLM, he has taught classes to military personnel on base, and has also spent time at Yale University, in Washington D.C. and in New York City working on national security matters for both corporate and governmental interests. Mr. Hallum has worked closely with former NSA and CIA employees to define security protocols and secure operating environments, and his work has appeared in classified intelligence briefings. He has climbed both Mt. Rainier in Washington and Mt. Whitney in California. He now works, under his real name, in the high tech industry near Seattle Washington.